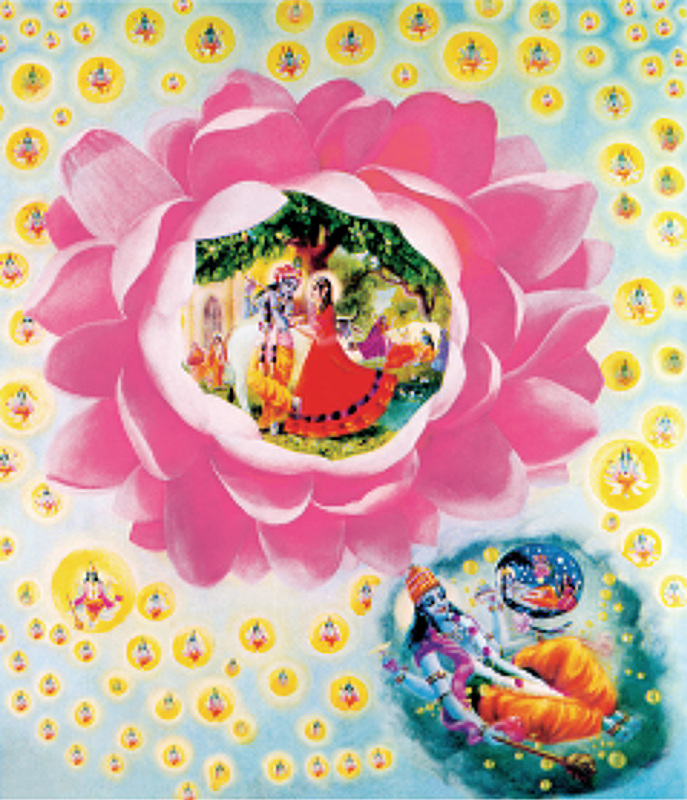 Bhagavad Gita Art Gallery--Plate 36: The spiritual and material worlds. PREVIOUS Bhagavad-gita 15.6 The huge lotus is the original spiritual planet, Goloka Vrndavana, the abode of Radha and Krsna. The spiritual effulgence around this planet is the brahmajoyti, which is the ultimate goal of the impersonalists. Within the universal brahmajoyti are innumerable spiritual planets which are dominated by plenary expansions of Lord Krsna and inhabited by ever-liberated living beings. Sometimes a spiritual cloud overtakes a corner of the spiritual sky, and the covered portion is called mahat-tattva, or the material sky. The Lord, as Maha Visnu, lies down in the water within the mahat-tattva, which is called the Causal Ocean. Maha Visnu enters each universe as Garbhodakasayi Visnu and lies in the Garbha Ocean on the serpentine Sesa incarnation. From His navel a lotus stem sprouts, ad d on the lotys, Brahma, the Lord of the universe, is born. Brahma creates all the living beings in different shapes in terms of their desires within the universe. He also creates the sun, moon and other demigods.